With sweet ribbons of peanut butter cheesecake brownies. Baked to ooey gooey perfection and eaten by the row. I have some kind of exciting and sad news. While I’ve been eating brownies and licking the chocolate off my face, m’boy’s jumped back on the P90X train. *exciting* He’s been doing fancy things like plyometrics, lifting weights, and “corn cobbers”. Not the buttery salty type – the horrible pull up type. I felt the need to try one of these corn cobblers, cobbers, whatever… after eating a few brownies. That was when I found out that I can’t do pull ups anymore. *sad* When did that happen? I used to be able to do at least a 1/2 pull up? 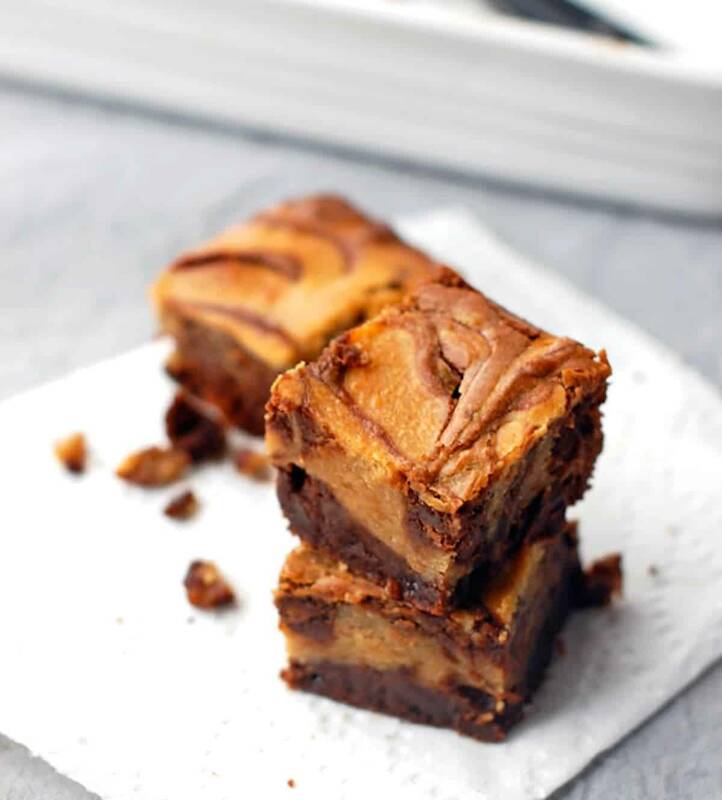 These peanut butter cheesecake brownies are so simple to make! Thick, rich, chocolate peanut butter cheesecake perfection. Preheat oven to 350. Prepare the brownie batter and spread into a greased 8×8 baking dish. Using an electric mixer, beat together the cream cheese, eggs, and sugar. Add the peanut butter, adding the cream as necessary to make the mixture more smooth. The consistency should be thick, but smooth enough to easily mix with the electric mixer. Add the vanilla and salt. Pour mixture over brownie batter and marble with a knife. Bake for 40 minutes, or until toothpick inserted in the center comes out clean. I used Ghirardelli Double Chocolate brownie mix for my batter. The only thing better than eating a peanut butter cheesecake brownie on a Friday night is eating a peanut butter cheesecake brownie with a sweet pug on your lap. We’re pug sitting this weekend. excitedscream! So, I made these for some family members that were coming into town. We downed them with a tall glass of milk hot out of the oven… it was late when we all crashed and I put the left overs in the fridge for some reason. The next morning I MAY have had one (or four) for breakfast with coffee. They are amazing chilled!!!! Would you suggest doubling the recipe for a 13×9 inch pan? Including using 2 brownie mixes? I want to make them for work but 8×8 just wouldn’t be enough. Thanks! Yep! I like them thick so I would double it. Oh my god, these oughta be illegal, yum yum yum. Just made them, did not wait for them to cool. Seriously, these taste like they were delivered from heaven…..my goodness….amazing! These look amazing! Chocolate + cream cheese + peanut butter! Yum!